I'm sorry, are you suggesting 1uzfe? That would be interesting too. The BEAMS motor looks very interesting, however it also looks to be a wiring nightmare. I never could find full documentation on that motor/ecu. It might be out there, but I didn't run across it. My step son is thinking about one for a MR2. I wouldn't go near it without a factory wiring diagram for whatever it came out of. Altezza, I think. Or one particular RAV4, first gen, maybe 2000. JDM only, of course. Sticking with the A block motors, like the 4AG series, is the easier way. No motor motor mount or transmission mount/fitment issues. Bolts right up in place of what you have, with perhaps a little adjusting of the firewall with a sledge hammer to clear the dizzy. I wouldn't bother with the large port (TVIS) 16v's. Small port, maybe if you could find one. I've put 20v's in 2 cars. They're a blast. Guys, I think we need to stop filling his head with the cool ideas. He’s just starting out, so that means we need to help him out with this little engine and try to get it going. I would like to suggest that you watch a few YouTube videos on how an engine works. That way you can come back here and understand some of the terminology that we will be using such as “top dead center“. Ha ha. Good idea on the you tube videos. I will do that. I understand the meaning on top dead center. But not really how to find it. I will you tube to find out. If you're going to do the shaving cream thing, then WHAT I ALWAYS HEARD was to put the piston at bottom dead center on the compression stroke, then put your shaving cream in, then do whatever you want to the spark plug hole, then crank the motor and the cream will push out the shavings. BDC may even be a bit excessive. Half way up on the compression stroke would probably be just fine. 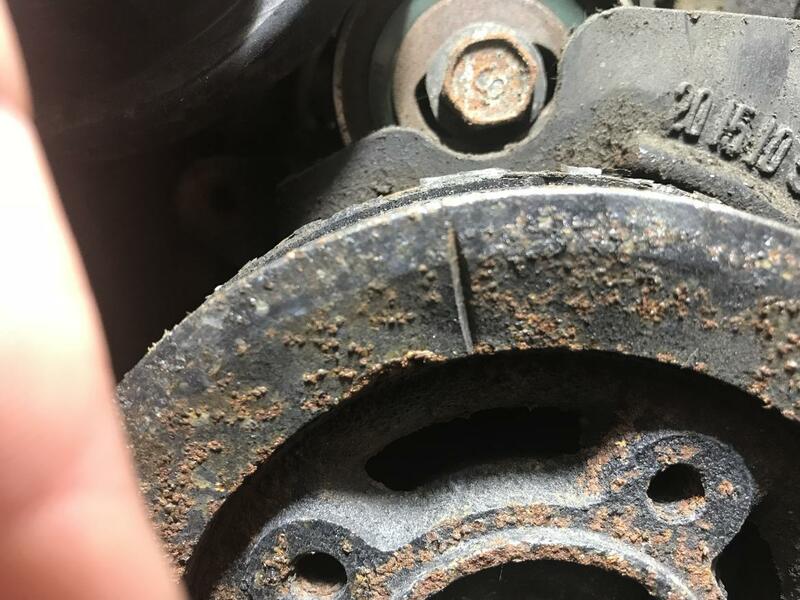 If you're just going to clean up the threads some with a thread chaser, you could probably get by with just putting some grease on the chaser and maybe have a shop vac handy, if the threads aren't too bad. Lol. I was going to, but then realized that’s not in his wheel house... YET! That chassis does 1uz very well. Thanks. I will try to check out that plug a little better, now that I have it in the shop. It does seem odd to use shaving cream in the engine. But I guess that is better than loose metal shards. On the 1uz. When I first was looking for a corolla I found this smoking tire episode. i was like ohh I want to do that. But then realized I have no skills ha. but where does he get the the 16 degrees, it is about 6 mins in. Is that just the optimal timing for this motor? He just starts talking about it. Also what is he actually looking for when he is using a timing light? He just wants the light to blink right on his mark on the balancer ? And is that mark at 16 degrees? thanks for all the help so far. I think at least am understanding some of the theory now at least. So I worked on this a little bit tonight. First thing is for the timing mark is it usually on the front of the pulley? Or more on the top close to the timing guide where it has the numbers. I couldn’t see anything but a grove on the front. If that is the right line then I think I have the timing dialed in. Either way no matter where I put the timing the terrible noise continued. I ran up the rpms. As it went up there was a range where the noise stopped and it sounds ok again. Any other suggestions for me to check out next? It really sounds like metal hitting metal. Can’t see video so just a shot in the dark but you mentioned a strange-feeling clutch. Perhaps the noise is something in the clutch? also, are you interested in a shoebox of new suspension parts?? Left over from our corolla rally car (which could be for sale). I ordered some feeler gauges, and will set the valve spacing when they get here. Hopefully that is it. Any other way to see if the clutch would be the issue if that doesn’t work? Other than pulling off the transmission.